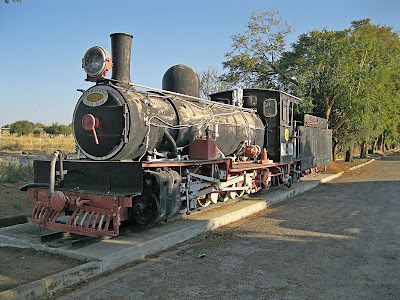 My brother Louis visited this locomotive in Namibia at Otjiwarongo station on 26 August 2007. This locomotive is #41, sister of #40 plinthed further south at Usakos station. This plate states the date when the locomotive was unveiled. 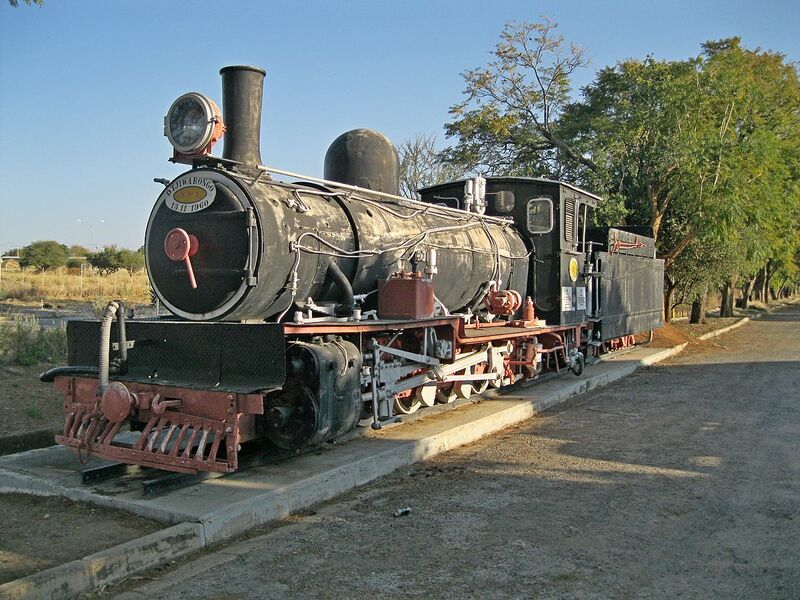 Narrow gauge operations ceased in 1960 after conversion of the Usakos-Otavi line to the Cape gauge standard. 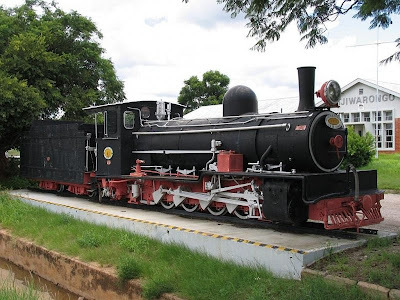 In 1912 Henschel built three 2-8-2 tender engines #40, #41 en #42 for the Otavi line for use on the Swakopmund-Karabib section. Like many other SWA locos they had dust covers to protect the motion. The carrying wheels were arranged as radial axles. As there were no separate boogie truck, the axle boxes were guided in such a way that the wheels could move radially with respect to the frame. These boys from Windhoek were playing the roles of driver and with the stoker applying the emergency brake! The plate proves that the SAR classed #41 as belonging to the narrow gauge class NG 5. 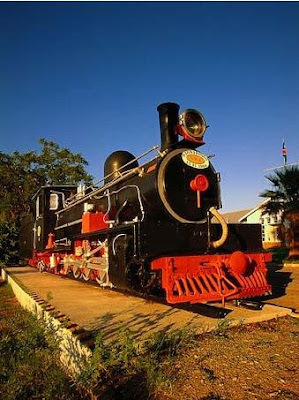 The white boards states in German that both the factory and the Otjiwarongo men's choir were involved in arrangements to get #41 plinthed in 1960 when the narrow gauge was broadend to standard Cape gauge. Information about the builder and the year built. This badge appears on the backside of the tender on this plinth. Interestingly, this number #76 belongs to another locomotive in the class NG. The NG5 class consisted of 6 locomotives similar to the class Hd of number #41, were also built by Henschel for use on the Otavi line. The main difference was that the Hd was fitted with air brakes, while the NG5's were fitted with vacuum brakes in keeping with SAR practice. A 1985 stamp showing one of the Henschel Hd Locomotives. "Smalspoor" is Afrikaans for "Narrow Gauge". 2008-06-29 - Image by unknown photographer. 2009-02-26 Photo by Date Jan de Vries. All three locomotives 40, 41 and 42 were in use until the Narrow-gauge railway line was replaced by in 1960 by 1,067 track. The 2-8-2 design needed a long fixed wheel-base, which caused a great deal of friction on the wheels. On the stamp the locomotive can be seen with just one steam dome. Originally they were delivered with one steam dome and a sand dome. For practical reasons the sand dome was removed, and sand boxes were fixed to the locomotives running-boards. 2012-07-23 - The locomotive again would appreciate a bit of a re-paint. Image courtesy of Alan Middleditch.